Buttocks Lift and Reshaping: Aesthetic surgery of the buttocks includes many methods. Patients may pursue to enhance buttock shape with liposuction, buttock lift, buttock implants or fat transfer procedures. Patients with traumatic buttock injuries and contour deformities from injections also need correctional procedure, often with fat injections, and autologous tissue flaps. The dramatic increase in body contouring after massive loss related with bariatric surgical treatments for obesity has also extended to buttock contouring. Weight loss creating flat buttock deformities are often severe in nature and pushing the need for buttocks lift and reshaping surgery. It is also important to understand the buttocks lift and reshaping surgery should address the whole back, flanks, hip and thigh as one unit, it is a rather back, buttock and thigh remodelling procedure. Recent studies in evolutionary biology have suggested a strong correlation between the “hour-glass” figure and overall physical and psychological health. This correlation is best summarised by an ideal waist-to-hip ratio of 0.7 that transcends cultures, is temporally stable, and is cross-generational. The purpose of the buttock musculature in stability and gait is an important consideration and often has an impact on the procedure chosen. No procedure must be carried out on the buttock area or the posterior contour without a complete assessment and thorough understanding of the complexity of it. Patients requesting treatment should be made aware about the potential risk factors associated with any surgical procedure. Plan your Posterior recontouring surgery. It is essential to understand the variances between the female and male buttocks. Curvy lines, round volumes and prominent projection, characterise a women’s buttock, while a men’s buttock is characterised by straight lines, square volumes and side depressions. Sagginess of the buttock should not be existent neither full gluteal crease which may indicate early ptosis. Full assessment and knowledge of all the above is critically important and should be brought to the attention of the patient prior to surgery. The fatty fullness under the crease, what I call “Banana deformity”, Cellulite-contour irregularity of the skin and the saddlebag has to be addressed. Buttocks Lift and Reshaping (buttocks enhancement) surgery should address all the above points to be able to create desirable results that match our patient’s expectations. There are different techniques suiting different patients for buttock contouring surgery. They include minimally invasive procedures, liposuction, buttock lifting procedure, buttock enhancement with lipofilling or implants procedures. Buttocks that is disproportionate in respects to corporal harmony. Flattening on the sides of the buttock (Trochanteric depressions) are unfavourable characteristics of the female gluteus that can benefit from the procedure. Buttocks reduction and reshaping with or without liposuction: for patients who have large buttock. Love handles liposuction: Fatty accumulation under the waist. Banana fold deformity treatment: Fold consist of fat deposit and fascial tissue at the junction of the lower part of the buttocks and the thigh. Gluteal retraction Treatment: irregularity, depression and hollows on the buttock surface caused by pathological conditions of the subcutaneous tissue, fascia or muscle. A quality cosmetic plastic surgery arises from clear vision and understanding of the beauty concepts of the buttock. 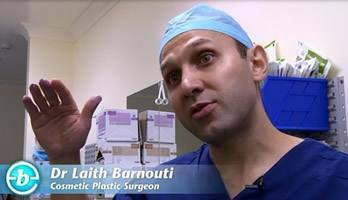 Dr Barnouti, specialist plastic surgeon, looks forward to helping you make the right decision about your health. You will have simple dressing and compression dressing at the back area for a week. You will also need painkillers and antibiotics for that phase. A follow up appointment will be arranged for removal of dressing and wound check. The sutures are dissolvable. You are encouraged to start walking immediately after surgery. However you will need to take it gently for the first 24-48 hours. Return to light duties in 1 week’s time.